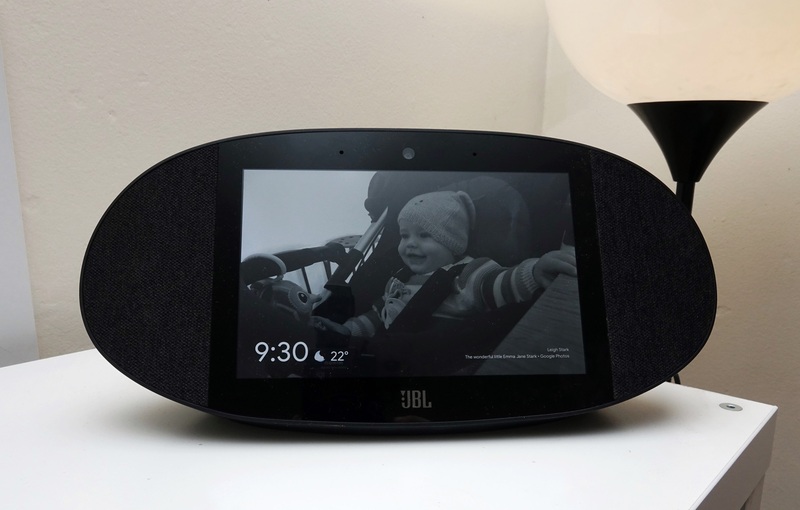 Google’s Home Hub isn’t the only smart display, and has been joined by the JBL Link View. With the same concept but a focus on sound, is it worth your time? The smart display segment is about to come alive, and there’s a pretty good reason why: it makes the smart home a little easier. Not sure if you can get over the idea of looking strange and speaking to speakers? The smart display makes it a little easier, translating your words into text as you talk, and showing you a little more. If you use a smart display in your kitchen, your words can command a YouTube video, potentially teaching you a recipe, with a command shortly after playing music. Leave a smart display in your living room to have it run as the coolest digital picture frame, automatically taking images from a photo library your phone keeps updated, with the smart speaker able to listen for your words and control parts of your home, play back music, tell you the news, and give you advice on whether you need to bring an umbrella today. Smart displays can act almost as training wheels for the smart home revolution, giving you something to talk to that shows a visual representation and makes the whole idea a little easier to swallow. But one thing that smart displays may not succeed in is the sound. Built around the screen, the sound might be the second focus. 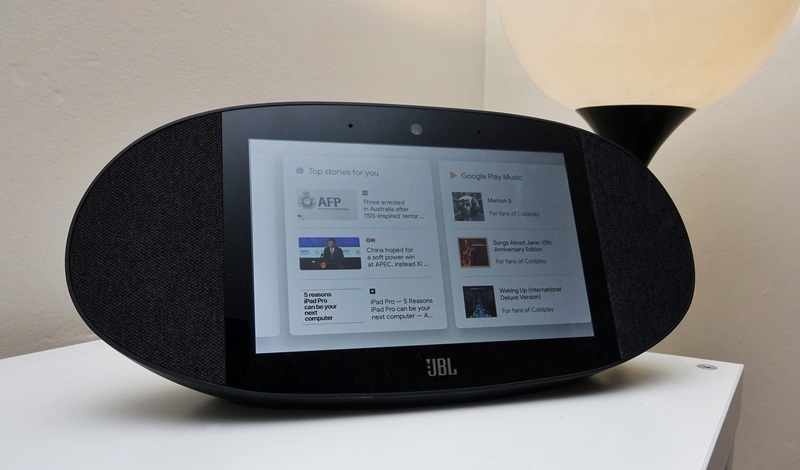 Not for JBL, however, which has built the Link View as a smart speaker that includes a screen. Is the JBL Link View the smart display you need in your life and home, or could you do better? The smart display space may well be quite new, but the designs appearing in that category already appear kind of same-same, with a screen matched with a speaker. On Google’s Home Hub, it’s a screen on a speaker, while JBL’s Link View is a screen in between speakers. It’s the same concept, but in a slightly different configuration, as the Link View offers an 8 inch display flanked on either side by speakers. 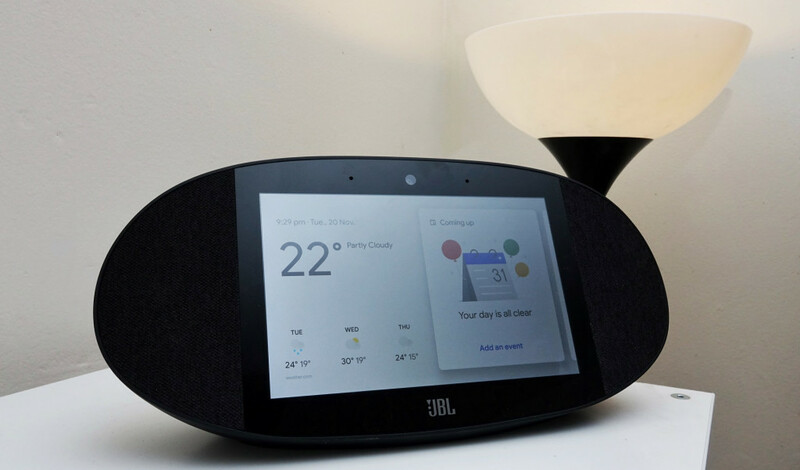 We don’t think the design is as attractive as the Google Home Hub, and the JBL Link View kind of looks like a screen in a football, but at least that design is there for a good reason: sound. Aside for JBL’s design aesthetic, one of the main reasons the Link View looks the way it is comes from the speakers, which sit on either side of the 8 inch screen. Inside each speaker section is a 5.1cm full-range driver, paired with the hardware and operating system needed for that 8 inch screen and Google Home’s operating system, as well as Bluetooth, WiFi, and a 5 megapixel camera built into the body to sit just above the display. There’s also a “PrivacySwitch” in the JBL Link View, which consists of a small switch that moves a bit of orange plastic in front of camera if you don’t want to use it. It’s also splash-resistant at IPX4 and includes a mute switch and physical volume buttons on the body, requiring only a figure-eight cable to keep the JBL Link View powered. Using the JBL Link View is easy enough, and voice will mostly be your guide, as well as the occasional touch and swipe. Like most other smart home products, using the JBL Link View means talking to your speaker, a concept that may be foreign to some people, but will gradually grow on you. What’s the weather like in North Sydney? Turn off the lights in the living room. These are just a handful of the sort of things you can ask a smart speaker, and because the JBL Link View uses Google Home to make its system work, you simply need to add “Hey Google” or “OK Google” to the beginning to have the Link View run them. Oh, and an internet connection and power, you need them as well, because they’re prerequisites of any and every smart display. Like Google’s Home Hub, however, there’s also the ability to use the Link View’s touchscreen by touching and swiping through screens. It’s fairly easy to get your head around, and the screen helps to make the system just that little bit easier for folks who expect an interface when all you really need to do it say a few works. 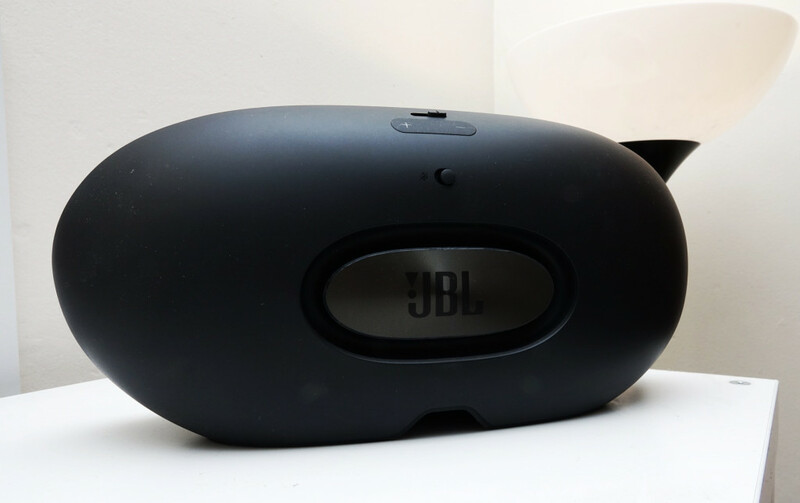 Once you’re done familiarising yourself with the sort of things you can say to a smart speaker — and you no longer feel strange doing so — you can get stuck into using the JBL Link View. 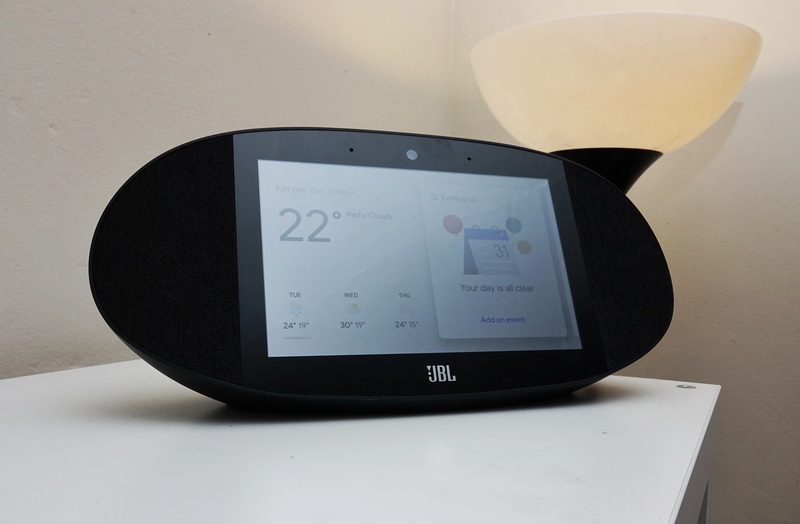 Built by JBL on the Smart Display concept Google introduced earlier in the year, you probably won’t be surprised to see that JBL’s Link View is basically the JBL version of Google’s model, the Home Hub. Because of this, the usability is spot on, so most of the performance is identical, too, with very little lag as you command the JBL Link View using your voice or swiping through the various menus. There are a few different features that separate it from Google’s, however, such as a camera for video calls, a blocker for that camera, and larger speakers on the side. That last one is the main point of difference between it and other smart displays, and after testing the JBL Link View with Pickr’s Sound Test, we can say that this speaker offers more volume and more depth than Google’s own speaker. Music run through Google Play delivered not just more to work with in the mids and lows, but a good deal more volume, as well. While we were comfortable with the volume at under half, we could see there was definitely room to move in the Link View, and if you had a big room, this should be able to fill it. Sufficed to say, you shouldn’t be at all disheartened with the sound on offer from the Link View. While it’s not the best speaker we’ve ever heard, it handles its own for sure. Without doubt, JBL’s Link View is the best sounding smart display yet. And at a good $130 more, JBL’s Link View is also one of the more expensive, packaging in a bigger sound and a few more features, though there is definitely a question mark looming over the Link View as to whether they’re worth that increase. Will you use the video camera? Maybe, maybe not. If you’re very reliant on your phone, possibly not, so that feature may not make the value argument. And what about the splash resistance? It’s there, but it’s minor. Again, we’re not sure this necessarily adds to the increase in price. At $349.95, the JBL Link View doesn’t quite win the value argument, but it doesn’t exactly lose it either. We think we could justify a price closer to $299.95, but given there’s a US price of $249.95, we get why JBL made it the price it is. While a question mark hangs over the price tag, it’s clear what the focus of the JBL Link View really is: sound. Unsurprisingly, the audio performance is one of the highlights of the JBL Link View, which is unsurprising simply because that’s what JBL is known for. In fact, it’s what quite a few entrants in the Harman brand that own JBL are known for, including AKG, Arcam, Harman Kardon, Mark Levinson, Revel, and of course JBL. 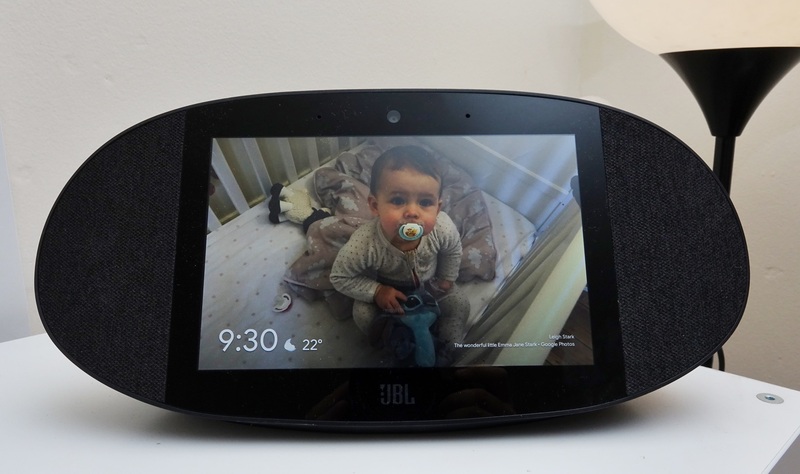 But while audio is a key point, the screen on JBL’s Link View feels like it could be a little better, and this doesn’t appear to be the same display we saw on Google’s Home Hub. At various angles, it can appear a touch dull, especially in comparison to Google’s, and there doesn’t appear to be as much brightness, either. It’s acceptable and certainly decent enough for the living room, but we definitely think Google’s take on the smart display emphasises the “display” part a whole lot better than JBL’s, though JBL definitely wins on the sound quality, which we suspect is kind of the point. Smart displays are still kind of an interesting concept for many, and one some reviewers are scratching their heads on. We get it, though: smart displays offer a great intro to the smart home world with a speaker that does more than just sit there, take orders, and act on them; they also show pictures and videos in the best evolution of the digital photo frame. Given the category has evolved from the smart speaker, it makes sense that great audio quality should be a factor, but so far, they don’t really feel like it’s there yet. And yet the JBL Link View feels like it delivers on that promise, bundling in plenty of volume and flexibility in the sound. There’s also a camera and a smidgen of water-resistance thrown in for good measure, giving it a reason to stand out. That said, there’s also the price, which feels a little overkill for features we’re not sure people will use. Yes, there’s plenty of power and sound, but the camera will likely be blocked up by JBL’s “PrivacySwitch” early on and never regarded again, and neither the screen nor the design are what we’d call the best in the business. If you can forgive the design and screen, and you come for a loud and proud smart display, you’ll appreciate what JBL has to offer. Frankly, we’re just waiting for the price to drop. When it gets to Home Hub levels, the JBL Link View will truly be competitive, and may even be more value packed later on.